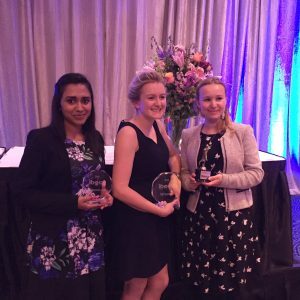 The Oxford University Animal Ethics Society, which is affiliated to the Centre, fielded a successful team to the International Business Ethics Case Competition that took place from 20-22 April in Cambridge, Massachusetts. The team comprised of Katie Javanaud (Keble College), Harshmeena Sanghani (New College), and Grace Young (Somerville College) presented on the Future of SeaWorld. The presentations addressed the ethical and legal issues facing SeaWorld following the documentary Black Fish, and suggested an ethical business solution comprising a mixture of virtual and augmented reality while moving the orcas to sea pens. The presentations were very well received with the team winning the 30 minute competition and coming runners up in the 90 second competition. The team also performed very well in the biathlon which accompanies the competition, with Grace placing in the top five female runners, and the team winning the overall biathlon competition. IBECC is organised by Centre Fellow Professor Tom White from Loyola Marymount University, Los Angeles. Further information about the international competition is available here. Videos of the presentations are now available. You can see the full presentation here, the ten minute presentation here, and the ninety second presentation here.